Over 29 years of as certified soccer referee. Earned U.S. Soccer Federation state referee certification (1982) & national referee certification (1992); Officiated over 140 Major League Soccer matches (1997-2006) including the 2002 MLS Cup Final; Officiated Lamar Hunt Open Cup Final (2006), U.S. Amateur National Cup Finals (1993 & 1995), & U.S. Youth Soccer Association national finals (1986); Became national referee instructor and national assessor in 2007; officiated numerous international matches for USA, Scotland, Haiti, El Salvador, Ecuador, Canada, China, Jamaica, and Colombia; refereed professional club team matches for Liverpool, Benfica, Sampdoria, AC Milan, AS Roma, Celtic, Ajax and more; refereed numerous state and regional matches at all levels. 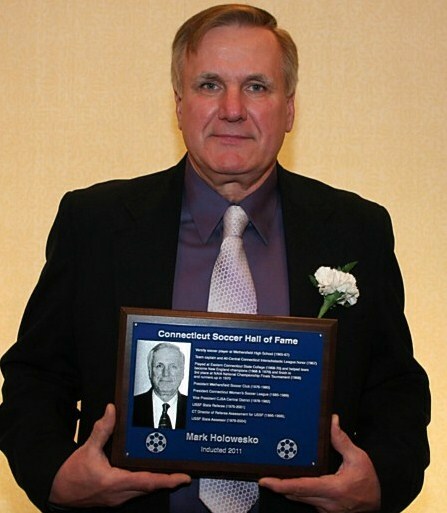 Varsity soccer player at Wethersfield High School (1965-67); Team captain and All-Central Connecticut Interscholastic League honor (1967); Played at Eastern Connecticut State College (1968-70) and helped team become New England champions (1968 & 1970) and finish in 3rd place at NAIA National Championship Finals Tournament (1968) and runners up in 1970; President Wethersfield Soccer Club (1976-1980); President Connecticut Women’s Soccer League (1985-1989); Vice President CJSA Central District (1978-1982); USSF State Referee (1975-2001); CT Director of Referee Assessment for USSF (1995-1999); USSF State Assessor (1979-2004). Staples High School Varsity Soccer (1996-1998); NSCAA High School All American (1998); 1998 Gatorade National Boys Soccer Player Of the Year; Registered 17 goals and 21 assists in 3 years at University of Virginia (1999-2001); Herman Trophy Finalist (Final 15 in 2000 & 2001); NSCAA College All-American (2000 & 2001); 2001 ACC Player of the Year; ACC Rookie of the Year (1999); Drafted 8th in MLS Superdraft by Columbus Crew and earned 2002 MLS Rookie of the Year; 2003 MLS All-Star; Played 141 MLS games with Columbus (106) and L.A. Galaxy (35); Played for United States at 2001 Youth World Championships in Argentina; Earned 8 caps for the US Mens National Team; Scored a goal against Panama in World Cup Qualifier for 2006 FIFA World Cup. 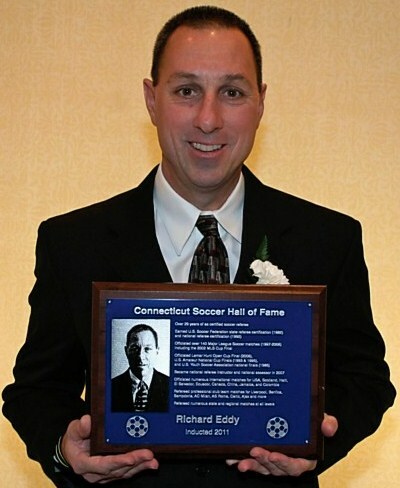 Played on Staples High School 1978 LL State Championship Team, received All-FCIAC Honorable mention; Two-time first team All-America at Middlebury College (1982 & 1983); Played professionally in Sweden’s Premier Division (1983), MISL with Memphis Americans (1983) and Dallas Sidekicks (1984), and American Indoor Soccer Association (AISA) with Louisville Thunder (1985) and Fort Wayne Flames (1986-88); AISA All-Star (1985); Head coach at Wheaton College (1989 & 90), Univ. of New Hampshire (1991 – 94), Brown Univ. (1995-2009), and Univ. 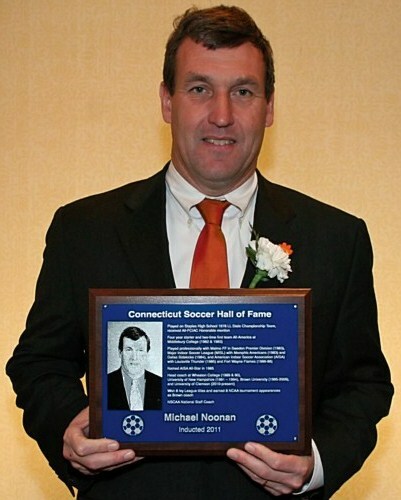 of Clemson (2010-present); Won 8 Ivy League titles and earned 8 NCAA tournament appearances as Brown coach; NSCAA National Staff Coach. 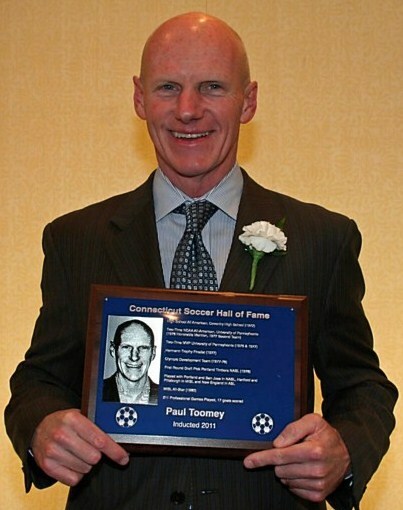 High School All American, Coventry High School (1972); Two-Time NCAA All-American, University of Pennsylvania (1976 Honorable Mention, 1977 Second Team); Two-Time Most Valuable Player at University of Pennsylvania (1976 & 1977); Hermann Trophy Finalist (1977); U.S. Olympic Development Team (1977-78); First Round Draft Pick by Portland Timbers of the North American Soccer League (NASL) (1978); Played with Portland and San Jose in NASL, Hartford and Pittsburgh in Major Indoor Soccer League and New England in American Soccer League (ASL); MISL All-Star (1980); 211 Professional Games Played, 17 goals scored. 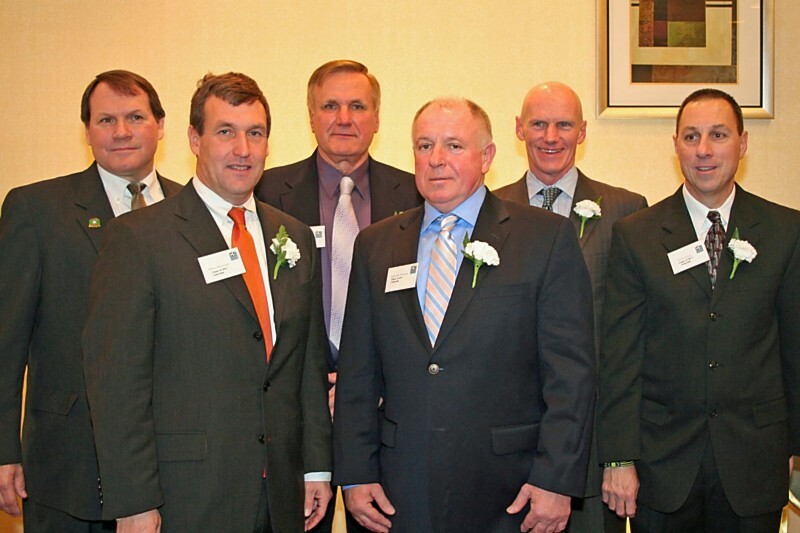 Farmington HS Boys Coach for 28 years with 430 wins, 68 losses, and 33 ties; 6-time state champion (1986, ‘92, ‘96, 2003, ‘08, ‘10) & 25 conference titles; 3-time NHSACA Regional Coach of the Year (2002, ‘06, ‘10); CT Soccer Coaches Association Coach of the Year (2001); Played at Wethersfield High School (1973-76) State Championship (1975); Two-time All New England (1978 & ’79) at Univ. 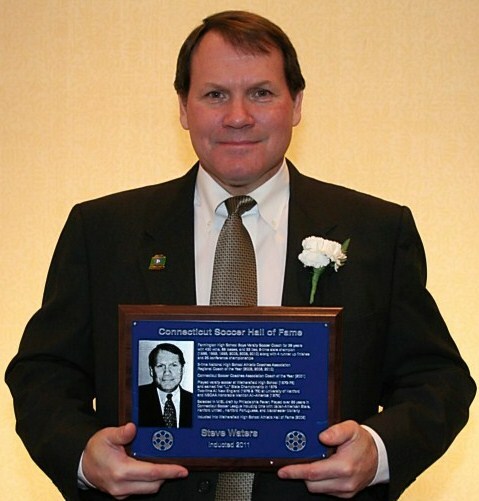 of Hartford and NSCAA Honorable Mention All-America (1979); Selected in MISL draft by Philadelphia Fever; Played over 25 years in Connecticut Soccer League; Wethersfield High School Athletic Hall of Fame (2005). Played professionally in Poland & Germany (1972-89) for Legia Warsaw (1976-1978), Hutnik Krakow (1979-1980) - scored most goals in the 2nd division with 17 goals, Ruch Chorzow (1980-84, 1988-89) winning Polish Div. 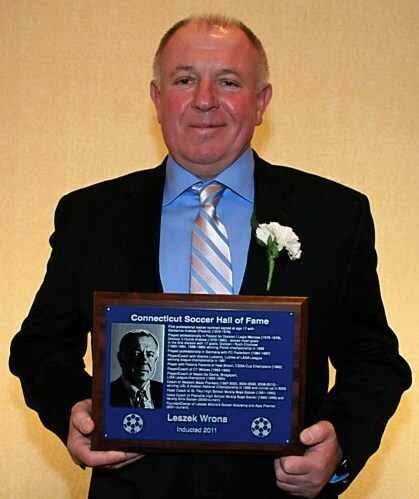 I title in 1989; Played professionally in Germany with FC Paderborn (1984-1987); Player/Coach with Gremio Lusitano, Ludlow of LASA League; LASA league champion (1991); Player with Polonia Falcons of New Britain, CSSA Cup Champions (1992); Player/Coach of CT Wolves (1993-1995); Player/Coach of Vasco Da Gama, Bridgeport, LISA League champions (1993-1994); Coach of Western Mass Pioneers (1997-2000, 2004-2006, 2008-2010) - winning USL 2 division National Championship in 1999 and runner-up in 2005; Head Coach of St. Paul High School Boys Soccer (1991-1995); Head Coach of Plainville High School Boys Soccer (1995-1999) and Girls Soccer (2000-current); Founder/Owner of Leszek Wrona’s Soccer Academy and Ajax Premier (2001-current).